The endless debate between the working mom and the stay-at-home mom. There have been movies about this topic, countless articles and even ad campaigns, yet the issue of mama drama still exists on so many levels. What is this “mama drama” I speak of? It is the endless debate between the working mom and the stay-at-home mom. Which is harder? Which is more exhausting? Which makes you a better mom? If you choose the more exhausting option, does that automatically make you the better mom? If you spend less time with your children, is the time with them better spent? If you spend more time at home with your children, are you an incomplete person or less of a positive example to your kids because you “don’t work”? Sadly, I don’t have the answer to any of these questions. My non-expert advice, coming from no other than a “stay-at-home-working-mom” (just to further confuse the issue), is to not worry about which is better, harder, easier, or more stressful, but to instead own the role we are in and just do the best, most effective job we can in our current situation. As women, we are caught in a constant paradox. It’s not enough of a struggle that we are sometimes faced with the decision of whether or not to stay home, but once the decision is made, there is ongoing internal and external guilt associated with either choice. These are the facts: being a mom is a full-time, exhausting, incredibly difficult role. 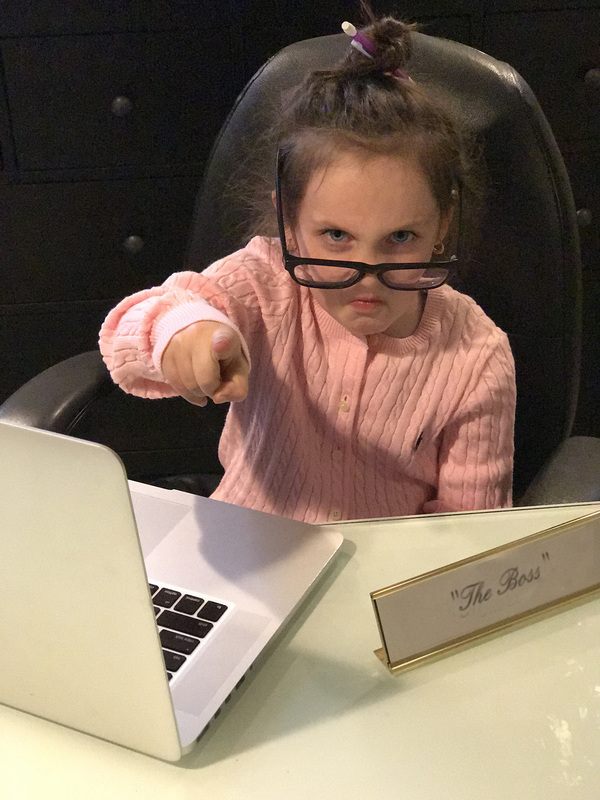 Whether you stay home or not, we all report to our under-5-feet-tall bosses (under 3 feet are usually the bossiest!). We are also all in a perpetual state of multitasking. The most important fact is, we are all doing our best and trying to figure out what is right for our family. So, why must we all grade our “mothering” and judge one another by how “hard” we work, or how exhausted we are? Isn’t the point to support one another and try to make each other feel less conflicted and less exhausted? Aren’t we all just moms and women trying making the most of what we have been given no matter our situation? What fulfills you as a mom or a person might not fulfill me. As long as we all have the same goal of being good people and raising good people…I think we’re all doing great!! Figuring out what that balance is that gets us to the ultimate goal of happiness is each of our own, individual journey. But, let’s at least eliminate that fear of not living up to other moms’ expectations! As a stay-at-home-working-mom I sometimes feel like I don’t fit the criteria of the “full” stay-at-home moms. Yet, since I work from home, I also can’t fully relate to the full-time-out-of-house-working-moms (try to bear with me here….). To stay at home moms, I am a working mom and to the working moms, I stay home! Ahhhhh! (This is all too similar to spending my life in Central New Jersey. To my North Jersey friends, I am 100% in South Jersey and to my South Jersey friends; I might as well be in the city.) Truth is, I really am in the middle. That is an ok place to be and I need to just embrace it so I can can continue down my path and be a productive, progressing human being. Mama drama unfortunately doesn’t end with the work issue. My mom will tell me how when we were kids she didn’t have “x,y,z, ” so life was harder. My grandma will talk about how she had even less, so parenting was even harder for her. That might all be true, but don’t they realize that all this “new world technology” we have now (which in many ways does make life easier) also presents moms with a whole new set of issues that the previous generation of moms didn’t have to deal with? Realities such as cyber-bullying, inappropriate websites, and kids downloading $1000 worth of apps “accidentally” are a constant battle in most households today. So, the argument over which is “harder” just continues. The comparison from one mom to another is passed down from generation to generation. Let’s come together to be the ones to stop this. We are all on the same team! So, here I go again with my optimistic ideas and plans for a more “perfect” world for us moms. You will see this ongoing theme in my posts, but in general, I just want us all to spend more time lifting ourselves and each other up rather than comparing and making the struggle more complicated for one another. If someone else is less happy it shouldn’t make another person happier. So…let’s end the mama drama and just go do what we do!